Chauvet DJ Swarm Wash FX 4-in-1 LED Effect Fixture with O-Clamp CLP-10 by Chauvet at IGWT. MPN: SWARMWASHFX. Hurry! Limited time offer. Offer valid only while supplies last. Swarm Wash FX Swarm Wash FX is a 4-in-1 LED effect fixture that combines an RGBAW rotating derby, RGB+UV wash, and a ring of white SMD strobes. 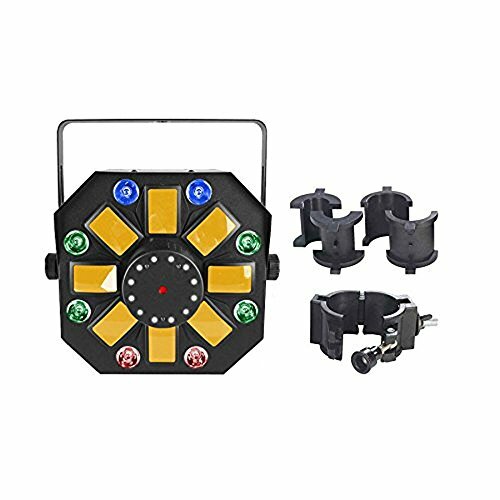 Swarm Wash FX is a 4-in-1 LED effect fixture that combines an RGBAW rotating derby, RGB+UV wash, and a ring of white SMD strobes. Create an endless array of looks by individually controlling each effect via DMX and master/slave modes. Other features include automated and sound activated programs and a user-friendly menu structure. Multiple units can be power linked to save time running cables and extension cords. Fits best in the CHS-40 VIP Gear Bag.